I cannot put enough emphasis on the importance of having a strong support network with for a person with COPD. So, how good is yours? How Does COPD Affect a Person’s Life? How you wake up in the morning can have a big influence on how your day will go – are you making the most of the day or are you fearful of what it will hold? These are questions you need to ask yourself. If you’re fearful of the day then maybe your COPD support network, or lack thereof, is part of the reason. Many people I’ve been in contact with who live alone find it quite difficult, as they have nobody to share the load with, nobody to remind them if they’ve taken their medication or help with the many requirements they have. If this is sounding like you, maybe it’s time to put steps in place to get some quality back in your day-to-day life. Consider these strategies to help improve your quality of life with COPD. Having a companion who you can rely on, whether it’s a family member or a friend, is an important strategy. They don’t have to be someone who’s by your side every moment of the day, but ideally it will be someone who is only a phone call away. I think it’s important to maintain as much independence as possible to keep the mind positive, however, we all need a hand. My travels are a great example. I’ve traveled from Australia to Los Angeles on to Florida and I’m now sitting on a deck of a cruise ship sailing through the Caribbean. None of this could be done without my support network, primarily my wife. However, my doctors, travel agent, online forum friends, airline and cruise-line staff have all played a part in this holiday. With my oxygen requirements, and the fact I tripped on day one of the cruise, strained my Achilles and ended up on crutches, highlights the importance of having a support network. This is the first time I’ve had to use crutches since being diagnosed and it’s a challenge – I look it as my temporary exercise plan. You might also like...Are There Any Foods COPD Patients Should Avoid? Having your home and work environments set up in a way that makes day-to-day life easier is also important. Having your medication, oxygen, telephone, and other essential items in easy to get to places means that if you have an episode you can access what you need quickly and not become anxious. My local pharmacy has all my medication scripts on file so I can easily email or send them a text message to have particular scripts filled. Some pharmacies offer a delivery service. This might be something to look at for those days you can’t get out. 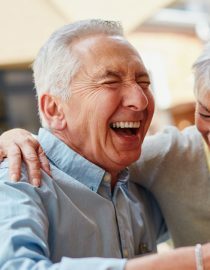 Next page: More tips on how to improve your quality of life with COPD, including learning about your COPD and connecting with others.